nMediaPC offers to HTPC enthusiasts and professional installers absolute special case – HTPC 8000. It’s completely wooden. Just has a metal plate on the front. The case is suitable for ATX and Micro ATX motherboards and offers four 3.5″ and one 5.25” bays. Up to seven full size expansion cards can be installed in the HTPC 8000. To chill equipment inside it’s used 140mm case fan. The front panel hosts optical drive door, VFD display (optional), e-SATA, HD Audio, couple USB ports and card reader. And, thank goodness, there is no any blinding lights there! The HTPC 8000 is too big to fit into ordinary A/V stand – 500mm(W) X 365mm(H) X 280mm(D). But the stylish antique red wood design helps to integrate it into your interior. I’d like to mention that case is not a concept for some exhibition. You can buy it just for $120! Moreover, the wooden case makes less noise than ordinary metal one. Not sure that I’d buy the wooden HTPC 8000. But it can be right choice for some non hi-tech interiors. This simple dashboard widget for Mac OS X allows to control your Boxee box remotely from your laptop over local network. It offers following functions: navigation, playback and volume control. Internally the widget uses XBMC HTTP API and works fine with Boxee Alpha 0.9.14.6992. You may download it here. The EnOcean Alliance did a big step to success. It openned a specification for its energy harvesting wireless sensors. What do it mean? It means that more producers can make EnOcean compatible products. It also means that devices produced by different manufactures will have a good interoperability between them. And finally openned specification will help integrators and developers to add support of EnOcean devices in their home automation system. EnOcean already offers unique feature for its devices. They don’t use batteries. Instead of that they transform electromagnetic, solar energy, thermocouples etc into usable electrical energy. That approach gives you possibility to build green system and save your money and environment. I’d like to note that LinuxMCE supports EnOcean devices. The implementation is not fully featured so far. But I’m sure it’ll be extended in the future. 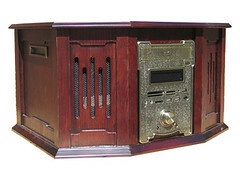 That article can be interesting for all who would like to have budget multi-room music system. The system uses Logitech Squeezeboxes as front-end and Squeezebox server as back-end. The Squeezebox server can be run on any Windws/Linux/Mac OS X PC. So the author bought compact, low power and fanless HP T5530 Thin Client PC. Plus two flash drives – 1GB for OS and 64GB for music. Sure, 64GB is too small for the large media library. But it can be extended by internal or external HDD. The author chose Debian as OS for Squeezebox server. It offers a simple way to install Squeezebox server from the SlimDevices repository. Everything should work out of the box – just add your Squeezebox device to the local network and specify the IP of the Squeezebox server. Nice DIY project. I’d like to just add a few notices here. Squeezebox server can be installed on NAS or router. If you already have some you don’t need to run detached PC. 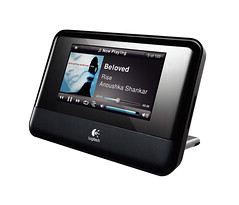 Also you can use Nokia Internet Tablets – Nokia770, N800 or N810 with adopted SlimSkin to control your music system more efficient and comfortable as well as iPhone.